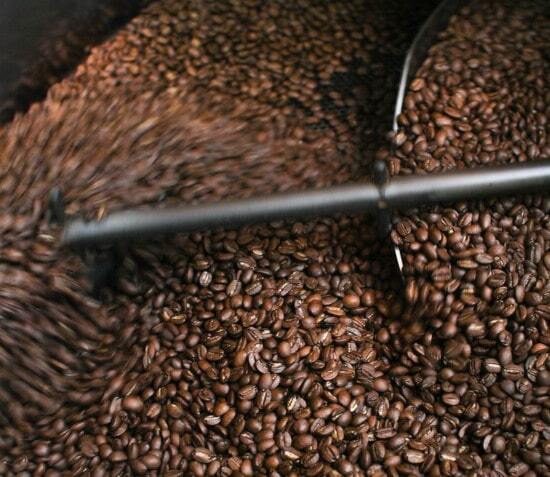 Is Roasting Your Own Coffee Beans Worth the Time & Effort? If you are interested in roasting your own coffee beans, you’re dedicated to coffee, and you probably also have a bunch of questions on how to do this yourself. Roasting your own coffee beans can sound daunting, but it’s actually easier than you might think. There are three ways for you to roast your own coffee beans at home: in a pan on the stove, in the oven, and in a popcorn popper. We are going to introduce these methods to you, along with all the steps to roast beans using those methods. Before you start your home roasting adventure, there’s some coffee knowledge you need. These five bits of information will help you understand what you’re about to do. Then we will get into the detailed how-to’s. You need to be able to ventilate the room you are roasting in. Look for a fan on your oven to use, or have a window open. There will be some smoke during the roasting process, and preparing ventilation in advance makes it easy to deal with. Notice the color changes and cracks in the beans during the roasting process. They will start out green, then change to yellow, to light brown, to golden brown, to dark brown. You’ll also see and hear the cracks the beans make. When they turn from light brown to golden brown, they crack the first time. This is when you take them off the heat if you want a light roast, or wait another minute if you want a medium roast. If not, let them cook from golden brown to dark brown, when they will crack a second time. This is when it will be a medium-dark to dark roast. Be sure to take the beans off shortly after the second crack, because they will get a very smoky flavor that will taste like charcoal if left on for too long. Nobody wants burned beans! The beans will continue to cook after you take them off or out of the heat source while they cool, so be sure to account for that when choosing when to remove them. There is a by-product of roasting coffee called chaff. This is the dry husk of the coffee bean and can be messy. If you want to avoid a mess, take your beans outside or over the sink to cool them in the colander or bowl. If you are having a hard time removing the chaff, just shake the beans in your colander a little harder. A lot of motion will cause most of it to come off by itself. After the beans are cooled, store them in an airtight container that is darkly colored, or in a place that has a cool temperature and doesn’t have a lot of light directly on the beans. Stored this way, they will last about a month before they start to go stale, although their peak freshness will be over just a few days after roasting. This method is comfortable because you are used to using a pan to cook meals. However, it can be challenging to do it just right. You might not have a consistent roast the first few times you go through the process. Don’t worry, though, we are here to guide you. The actual roasting will take five to 10 minutes, depending on how much you want your beans roasted. Here are the items you need and the steps to roast coffee beans in a pan. We also added some tips. Tip: Using a cast-iron pan will generate heat faster and hold it longer to help reach the right temperatures. Heat your pan on medium to high heat. Let the pan reach about 500 degrees Fahrenheit. Heat adjustment throughout roasting may be necessary, but don’t make it much hotter than 500 degrees. 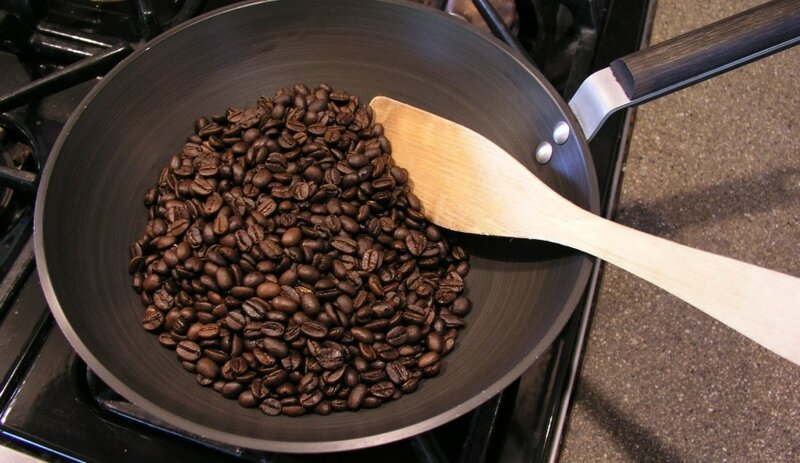 Measure out a half-cup of green coffee beans and pour them into the pan. You can adjust the amount if you want more, but start small. You want to be able to stir them around easily. Start stirring and keep doing so while the beans roast. This helps the heat distribute evenly. Let the beans change color from green to yellow to light brown and have their first crack. If you want light roast, stop roasting. If you want medium roast, remove the beans from the heat after they change color to golden brown, but before the second crack. If you want a dark roast, let them crack the second time, then remove them from the heat. Once the pan of coffee beans is off the heat, dump them into the metal colander or bowl. Stir them around to keep them cooling down. Be careful, since the beans are still around 450 degrees. De-gas your beans for eight to 20 hours and then store them properly. Enjoy! This method is just as easy as the stove top method if you have a cookie sheet or another tray with edges that can go in the oven. A plus side to this method is that it gets even roasting results. It only takes between five to 10 minutes to roast the beans using an oven. Heat your oven to 500 degrees Fahrenheit. Spread your half cup of beans on your cookie sheet or tray evenly. Put it in the hot oven on the middle rack. Reach in with your spoon and stir your beans every one to two minutes. Listen for the first crack at around four or five minutes. Then you can decide when the beans are at the right roast level for you to take them out of the oven. Remember that they will cook a little longer after removal. Put the hot beans into the metal colander or bowl. Shake or stir them to cool the beans faster. Let your beans de-gas for eight to 24 hours. Store your beans properly and enjoy for the next week until you do it all over. A popcorn popper can actually be very useful for roasting. This method also takes five to 10 minutes. However, not all popcorn poppers can handle the task. There are some hazards to make sure you avoid first. We have listed the things to watch out for before you roast this way. Vintage is better! Try to use an older popcorn popper. Surprisingly, the older models work better for roasting coffee, because they get hot enough while most of the newer models don’t. 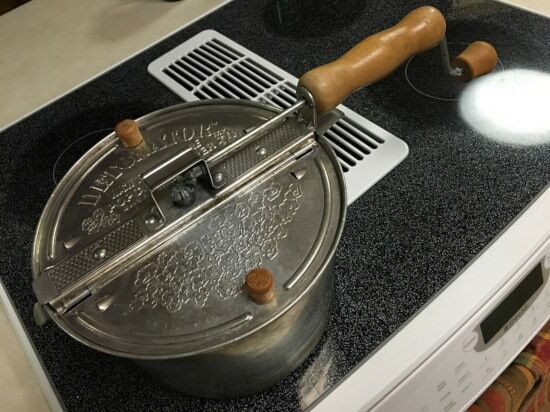 If you just happen to have an antique popcorn popper that’s functional, then you’re in luck. If you don’t have one, but still want to try roasting coffee with one, we suggest looking at secondhand stores and garage sales. If you are adamant about using a new model, choose from brands like West Bend and Kitchen Gourmet. Make sure your popcorn popper has good ventilation. It needs air vents along the inside wall of the roasting chamber in order to ventilate properly. If it doesn’t already have a vent, you can always modify it to make one. Or just save yourself the hassle and roast with one of the other two methods. You don’t want a mesh screen on the bottom of the roasting chamber. It has a tendency to catch fire. If your popper has one, just remove it or modify it to make it safer to use for roasting. Now we can move on to the supplies and steps, so you can try this yourself! Turn on your popcorn machine, and put your 1/2 cup of beans into the roasting chamber. Let the beans start to roast. Stir them continuously for an even distribution of heat. One negative aspect of this method is that it doesn’t always get the beans all the same color, and they can roast unevenly. This is why stirring is important. Stir until you observe the beans being able to move freely on their own in the chamber. Tip: Don’t leave your beans unattended in the popcorn maker. This is a method you want to keep your eyes on. As with the other two methods, let the beans change colors and crack. You can decide when you want to remove them to cool. Half the fun of roasting at home is having complete control over some of the flavors developed in the coffee from the roasting process. When you’re ready to remove them (just before the color you actually want), turn off the popper and pour the beans into your colander. Stir them inside the colander to help them cool. Don’t forget how hot the beans are; handle with care! Tip: Make sure you clean any chaff out of your popcorn popper before turning it on again. It’s dry plant material and can catch fire. Let your beans de-gas for eight to 24 hours. Then store the beans and enjoy your hard-earned coffee roast! If you are roasting beans yourself at home, you have to know about de-gassing. It is necessary in order to have the best flavors when you roast. Otherwise, the coffee won’t taste fantastic and you’ll think it’s all your fault when it isn’t. First, let us explain what de-gassing is. 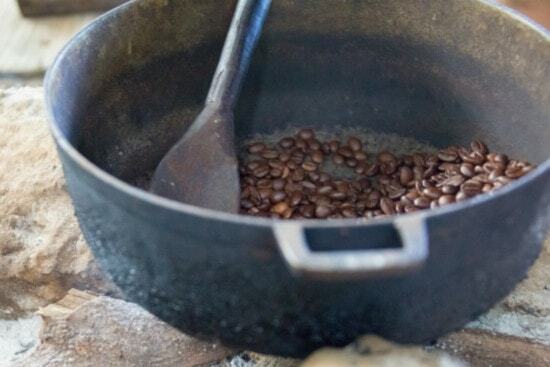 During the roasting process, gasses form inside the coffee beans. After roasting completes, the gases, mostly carbon dioxide, start seeping out. Most of the carbon dioxide will leave the beans within the first 24 hours that they de-gas. What’s the best way to de-gas? Just place your beans in the storage container you plan to use, but keep the lid off or slightly open for the gases to escape. De-gassing is necessary after roasting for at least a few hours and up to 24 hours as mentioned. After that point, you’ll want to start protecting the beans from oxygen, which can cause them to start going stale. Related: what are the different types of roasts, and which one is right for you? Roasting your own coffee at home is truly a special skill that, according to those who do it, can quickly become an addiction. Most people can’t go back to store-bought beans after roasting their own. After getting the initial process down, it’s easy and the coffee tastes fresh and flavorful. We have shown you three different ways you can roast your own coffee at home, along with all the information you need to do it right. Try one of our methods out and see for yourself why so many coffee lovers have started roasting their own coffee. While it’s a fun activity, many asked us if it’s really worth the time and effort. We reflected on this and ended up writing the blog post found here. © Copyright 2019 Coffee Channel. All Rights Reserved. Coffee-channel.com is a participant in the Amazon Services LLC Associates Program, an affiliate advertising program designed to provide a means for sites to earn advertising fees by advertising and linking to amazon.com.